It seems I have fallen into the trap that is collecting larger scale diecast. As many of you may know, I’m a huge fan of the R35 GT-R. My avatar picture is proof. While the R33 remains my favorite of the GT-R line, the R35 is what really started my love of GT-R’s. I know it’s been a very controversial car, as is what normally happens when a car is just that great, but let’s not get into that here. For today, I have Brian O’Connor’s car from Furious 7, the modified dark-blue Nissan GT-R. Allow me to express my dislike for the Furious 7 movie for a moment. It is terrible in the eyes of a purist F&F fan. There are a grand total of zero racing scenes in the movie, and everyone is seemingly immortal. And that one Race Wars scene is ridiculous. Vin Diesel somehow knows that the dude in the R8 is gonna blow up his car before it even happens. Don’t even get me started on those headbutt car-crashing duels. Just a horrible movie from my point of view, regardless of how well it did at the box office. I picked this up at Toys’R’Us at a very “you can afford it, pal” price of $29.99. Sure, it’s not the steal that those $13.99 Maisto’s at Costco are, but this one’s got some little details that make it worth the price tag. Being a Jada, you usually expect to see some wacky things with the casting, things such as oversized wheels, overblown fenders, and exaggerated proportions. That’s not really the case here. This GT-R is very true to its original form, without being overdone. I know Jada also makes the 1/24 version of this model. I have a previous 1/24 non-F&F R35 GT-R and I hated it. The whole front end is done all wrong and the car is too tall. The 1/18 is much improved from the 1/24 and I would recommend everyone stay away from Jada’s 1/24 R35. 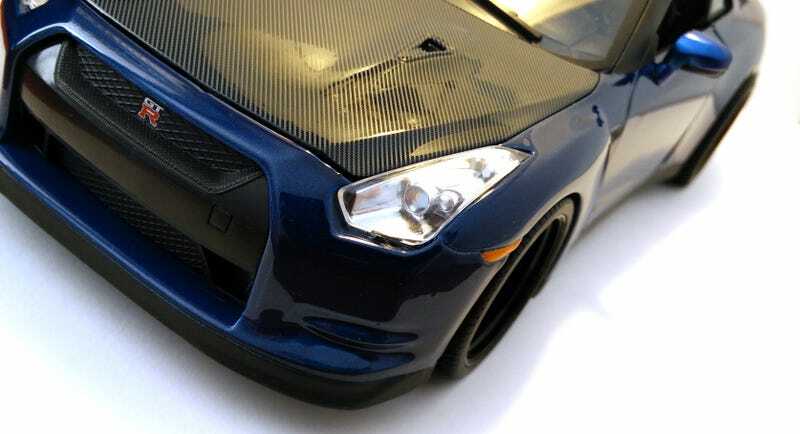 This is a modified GT-R from the movie, and Jada has attempted to replicate that with this model. It’s got the carbon-fiber hood and trunk, aftermarket racing wheels, and that gigantic wing. The one major inconsistency is that the facelifted 2011-and-on R35 is used in the movies whereas this one is clearly the pre-2011 version. You can tell by the lack of foglights on the front bumper as well as a few missing air ducts here and there. Compared to, say, a Bburago R35, this one is superior for so many reasons. First, there’s no ride-height/camber issue. Second, the details on this one are far superior, especially with the rear end. I love the circle of LEDs on the rear lights of this Jada GT-R. And the exhaust is very well done, with plenty of depth to make it look realistic. From the side, you can see that while this is much better than the 1/24, something is still off near the front end of the car. Perhaps the front needs to be a bit longer, and the front spoiler should be closer to the ground. The interior is what you get with a budget diecast car like this. I don’t care too much as long as it has one, honestly. I’m all about the exterior when it comes to diecast. The engine bay and trunk are what you normally expect for a 1/18 that costs $30. Everything is there as it should be. I do like the carbon fiber print on these, though. Those taillight details, as I alluded to, are wonderful. Headlights are nicely detailed too. This car looks best from the rear quarter shots. And I’m a fan of giant wings, ridiculous or not. As long as they’re not those cheap looking plates of metal that you see on riced out Civics. And those deep-dish racing wheels. They’re far too deep compared to the car in the movies, but I like the design of the wheels very much. And behind those wheels are rotating rotors with stationary gold calipers. One thing about Jada is that they know how to do wheels and brakes. My example has an alignment issue with the rear bumper, so please inspect closely if you plan on buying this one. But hey, you get what you pay for.